Orono Por. Muang Ubon started competing in Muay Thai at age 11. At the age of 15 he joined the Por Muang Ubon camp and became known among the Thai media as “Super Black”. Orono is considered a legend of Muay Thai and in my opinion correctly so. Orono’s accomplishments even among great Thaiboxers stands out. Orono is a 3x Lumpinee Champion, and a King’s Cup tournament winner and Sports Writers of Thailand’s pick of Fighter of the Year. 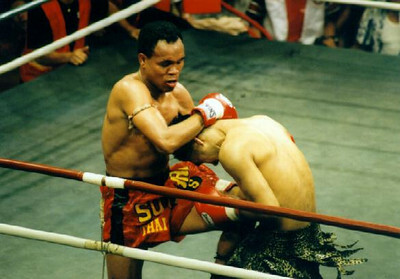 Orono won the Thailand Muay Thai fighter of the year honor in 1996 by the Thailand Sports Authority. Orono has fought a virtual who’s who of Muay Thai names in; Sangtiennoi, Jongsanan, Den Muangsarin, Kaolan, John Wayne Parr, and Ramon Dekker. Kaoponlek is a well decorated Thai Fighter as well having won the Lumpinee Championship, the Rajadamnern Championship and Thailand Champion. He now resides in Italy where he has been a Kombat League champion and has fought and defeated the likes of Charles Francois, Michael Dicks and several current names of international Muay Thai. But in 1997 for both boxers it was a fight between one established great and one fast rising fighter soon to be great. ~ by fatsoking on November 10, 2012.